The winter sun sets behind the Sekhmet Temple. I love the opportunities and adventures that are presented me when I am open to them. For example, the Diva Spouse and I had talked about hosting a few people for cookies and fireworks viewing at Diva Central to close out 2010. One set of friends said they would come and we started planning. Except, the same night another group of friends invited us to dinner for the same time slot. It could have been one of those “we don’t know what to do so we’re gonna sit at home and not do anything” nights but I got creative and asked for a bigger table at the restaurant. I have been wanting to play matchmaker between different sets of my really cool artsy-fartsy friends and an unexpected invite to dine at Lotus Of Siam on New Years Eve provided the perfect opportunity. My second visit to Lotus Of Siam was a much better experience than my first, mostly because I got to share it with great people like Samantha Ratcliffe (a philanthropist and event planner who also owns Vegas Rock Dogs) and her hubby James D’Arrigo (sax player/horn contractor for Sandy Hackett’s Rat Pack and Domenick Allen’s Vinyl band and producer of a couple of hundred Vegas shows including the upcoming 2nd annual Funny Bones charity event for local dog rescues), Mark Giovi (lead singer in Bite at the Stratosphere among other projects), Steve Lee (photographer and co-partner of UKLV, a Brit social network group) and their respective spouses, Sophie Duncan (amazing jewelry designer and fiance of Jet Tila), Andrea Bensmiller (bass player, vocalist, music teacher and Body Attack instructor) and her partner Toni Forster (promotions producer for local Fox 5 News). The food was, of course, fantastic (you can read about my previous review here). I learned from my previous overly-adventurous outing and stuck to the tried and true while sampling from the plates of the more experienced Thai diners. So I loved my meal and walked away with a list of four or five items to try next time we go there. Both the food and the conversation were lively and we all left the restaurant having had a thoroughly enjoyable experience with both the food and the company. Being a no-longer-20-year-old local I have no intention of ever actually being a part of the throngs of party central (nope, not on my bucket list) and I can’t imagine how cold it was for the hundreds of thousands standing along Las Vegas Blvd, especially those scantily dressed party girls from So Cal that have no idea how cold it can get in the desert. We made it home with plenty of time to change into warmer and more comfortable clothing to watch the ball drop over New York’s Times Square on TV and run up to the roof deck to see some of the fireworks go off over the Strip. Unfortunately, since it was in the mid-20’s and slightly breezy I made it about a minute and a half before running back into the house to finish watching the show on TV. On New Years Day, Bill and I decided to take a little drive over to the amazing Sekhmet Temple just past the main gates of Creech Air Force Base near Indian Springs. 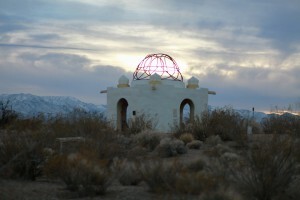 I was told about this little sand-colored stucco open air temple by a friend of mine, Darryl Ginwright, who had recently taken photos and posted on his Facebook page and since then I have wanted to check it out and photograph it for myself. On the way, we stopped by Retro Bakery in the Northwest Centennial Hills area of the valley for some of the most amazing cupcakes in Las Vegas, each lovingly made by rockstars Kari and her hubby Bryan. Now I have had heated debates with friends over whether or not Kari’s cupcakes are the best or not but in my humble opinion hers are the most creative flavor combinations and as is my taste and her philosophy: “it’s all about the buttercream.” Since I met Kari and Bryan through social media over a year ago, they have been exploding in popularity, thanks to Kari’s Twitter prowess and contagious personality and creative twists on familiar flavors all at reasonable prices. If you are a cupcake lover then Retro Bakery is an absolute “must” but be warned, I am almost certain that Kari’s mugshot is on The American Diabetes Association’s 10 Most Wanted list. 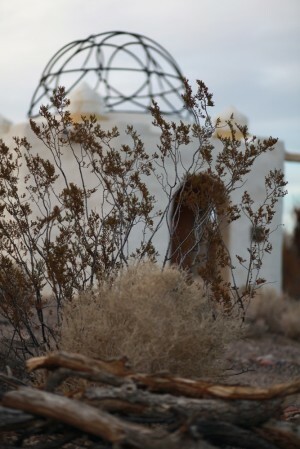 Winter desert foliage with Sekhmet Temple behind. Back on the road, we drove up the highway to the Sekhmet Temple with sugary goodness in our hands. According to the website, The “Temple of Goddess Spirituality Dedicated to Sekhmet” is a project of the Center for the Study of the Gift Economy under the direction of Genevieve Vaughan. This small, square structure (maybe 200 square feet) dedicated to celebrating the Sacred Feminine and Mother Earth has four arched doorways faced in opposing directions with an open roof made of seven interlaced copper rings. It is not only open to the elements it is open to the public, literally situated just a few hundred feet off of the highway. I’m sure the drunken party girls think they had a great time—at least the parts of it that they can remember. But as we mark the midpoint our sixth year living in the Vegas Valley it was great to mark the beginning of a new year and a new decade with stuff that tourists don’t even know exists. World-class food in a strip mall and fireworks on the roof followed by a spiritual sojourn made while munching cherry-cheesecake and peppermint bark cupcakes. Wrap it all up with awesome friends and it was a great way to kick off 2011. Right about now, I need a nap but the Diva will be back in the pit shooting away very soon. If you are at a local show make sure you say hi. 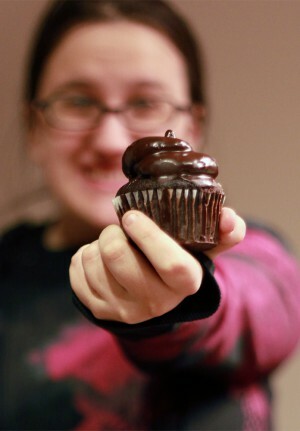 I’ll be the one holding a camera in one hand and a cupcake in the other. Here’s to a remarkable new year. I’ve been to a couple of the ceremonies at the temple. It’s very nice.